For this month’s Michael’s Makers challenge, we were asked to tackle some holiday challenges and to come up with some fun solutions to common struggles. Of course, I chose ideas for wrapping difficult gifts. You can also check out some of the other holiday project ideas here or see the four other holiday hacks topics at The Glue String blog. I always love it when the gift wrap is also a gift in itself. You can find a few different kinds of muslin gift bags at Michael’s and they are perfect for personalizing and decorating to hold a very special gift. 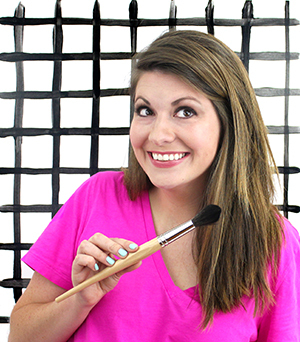 It’s really easy to achieve an ombre dip-dyed look. Buy some fabric dye and follow the instructions on the package to mix it with the right amount of water in a container a little bit wider than your bags. Start by dipping the bags for just a few seconds most of the way to the top. Then lift the bags out so that only half of the bag is still in the dye. Let this soak for about 5 minutes, then pull the bags out further so that only the very bottom is still in the dye. I ended out adding a little more dye to the mix at this point to get a strong pigmentation at the bottom. Just be careful that if you drape the top of the bags over the edge of your container, the dye will start to drip down towards the top. You can actually see where this happened in one of the bags. I love how it looks in the end, but just be aware that this will happen. Rinse the bags when you are done and let them dry. I also ironed mine because they were a little wrinkly. I am seriously obsessed with these little guys. They’re really easy to put together and they have such a great impact. I also love filling the ornament with little bows as well as the present because they are so cute. This is also a great way to wrap a handmade gift, like this beaded wrap bracelet I just made with a class I took at Creativebug. 1. Fill your ornament with your gift and any other pretty extras you may have. You could also even decorate the ornament itself first, and tie on a ribbon to the top. 2. Cut the bottom off of a clear plastic gift bag. The ones I used were about 12 inches tall. Now you are left with a clear plastic tube. (You could also just buy clear plastic wrap in the gift wrap section at Michael’s). 3. Trim a stack of layered tissue paper to be slightly shorter than your plastic wrap and about two feet wide. 4. Wrap the tissue paper around your ornament so that the ornament is centered. Slide this whole thing inside of the clear plastic bag and center it. Tie ribbons tightly around the top and bottom of the ornament to create the candy look. 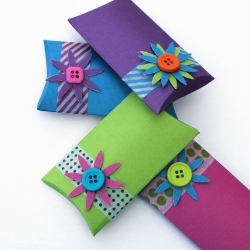 You could also use fun patterned tissue paper for a cool look. So this is actually an idea that I’ve shared before, but I really love these little paper pyramid gift boxes. I went into a little more detail on how to assemble them in my original post. You can also find the free printable template at Sassafras. 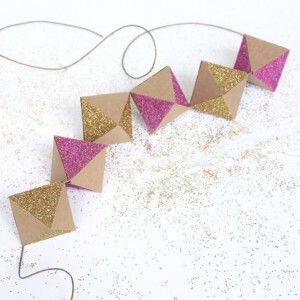 These little pyramids are one of the easiest gift boxes to assemble – you don’t even need any glue or tape of any kind. All you have to do is print the template onto colorful cardstock, cut out the shape, and score along the edges. Then you punch little holes in the four tops of the pyramid, fold over the tabs, and secure the box by threading ribbon in and out of the holes and tying a bow. You can then fill the little boxes with gifts, and maybe even add a little gift tag to the top. They’re easy to open and even reuse. What about you? 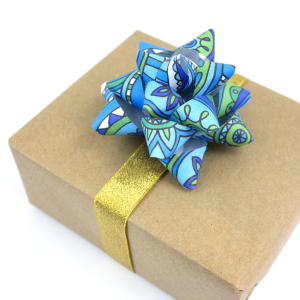 What are your favorite ways to wrap small presents? I love the idea of putting a small present in a clear ornament with bows. So cute!! Thanks Haeley! I love those tiny little bows!